Is it possible to enjoy the holidays without compromising your diet? Yes! We teamed up with our Publix Aprons Chefs and Corporate Dietitians to bring you delicious substitutions for the holiday classics. Not only will your palate thank you, but your waistline will too! When you think of classic holiday sides, what comes to mind? Mashed potatoes came to ours. This dish can often be loaded with butter and heavy cream. What tasty alternatives are there? Try our Cheesy Cauliflower Mash. By switching out potatoes for cauliflower and using reduced-fat dairy products, we were able to provide a delicious side dish with less fat and saturated fat than its more traditional version! 1. Place the cut cauliflower pieces into a steamer basket and put into a steamer. Cook the cauliflower until it becomes very tender. 2. 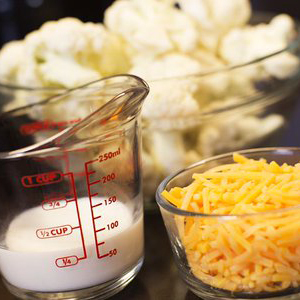 Remove the cooked cauliflower from the steamer and puree to the consistency that you prefer. This can be done in a food processor or by hand with a potato masher. During this process add the half & half and cheddar cheese. 3. Season the cauliflower mixture with the kosher salt and ground white pepper. Serve immediately or reserve in a warm place until you are ready for service. Not a cauliflower fan? That’s okay! Try our Roasted Fall Vegetable recipe instead. These tasty veggies are a great substitution for many holiday sides you prepare. The good thing is, by roasting the ingredients, you bring out the natural sweetness without needing added sugars. All that’s left to say is, yum! 1. Preheat oven to 450°F. Whisk apple butter and oil, in a large bowl, until smooth. Stir in all vegetables until well coated. 2. Line baking sheet with foil; arrange vegetables in single layer. Sprinkle garlic salt and seasoned pepper over top. Bake 35-40 minutes, stirring occasionally, or until vegetables are tender and golden. Serve. Our modified Apple Sage Stuffing will knock everyone’s socks off! This stuffing is texturized with crispy apples and dried berries. Its lean ground turkey base and omission of eggs and whole milk (found in the traditional recipe) makes for an appetizing side dish. 1. Preheat oven to 450°F. Heat large sauté pan on medium-high 2-3 minutes. Add crumbled turkey into pan: stir in sage, trinity mix and berry medley. Cook 5-7 minutes, stirring often, until meat is well browned and vegetables are tender. Meanwhile, peel apple; cut into small pieces. 2. Stir flour into turkey mixture and cook 2 minutes, stirring often, until flour is hot and well blended into mixture. 3. Stir in apple, broth and stuffing mix until well blended. Coat 2-quart baking dish with cooking spray; add stuffing mixture. Bake 20-25 minutes or until golden and internal temperature reaches 165°F. Use a meat thermometer to accurately ensure doneness. Let stand five minutes before serving. 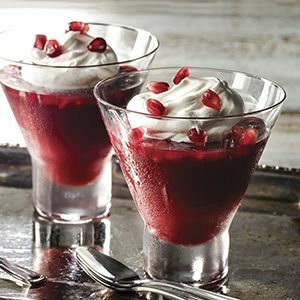 Wit h our Pomegranate Gelatin as your night’s treat, you will not feel like you are sacrificing any flavor. Its fresh fruit will delight your sweet tooth and help bring your holiday dinner to a tasty and festive ending. There you have them, four alternative recipes that will help you make this season festive. Do you have any sweet or savory dishes that you are looking to update? Share them with us in the comments and we will be happy to help!